Few genes have been studies as intensely as apolipoprotein E (APOE). In particular, one of its variants, the epsilon-4 allele has been especially scrutinized because it is correlated with an earlier onset (about 10 years earlier than average) of Alzheimer’s Disease. Among the many roles of APOE – its just a tiny cholesterol binding protein – are those as participant in synaptic plasticity, early neural development, damage-response and other processes – all of which share the need for the synthesis and movement of neuronal membranes (see the fluid mosaic model) and their component parts – such as cholesterol. 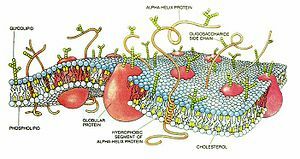 Hence, whenever neural membranes are being synthesized (plasticity & development) or damaged (overstimulation and other sources of oxidative damage) the tiny APOE is there to help with its membrane stabilizing cholesterol molecule in hand. Over the course of a lifetime, routine damage to neuronal membranes adds up (particularly in the hippocampus where constant storage-recall memory functions place enormous demands on synaptic plasticity systems), and individuals (such as epsilon-4 carriers) may simply show more wear-and-tear because their version of APOE is not as optimal as the other forms (epsilon-2 and -3). With this etiological model in mind, perhaps you would like to take better care of you cell membranes (much like your car mechanic implores to change your car’s spark plugs and oil to keep the engine clean on the inside). Moreover, perhaps you would like to do-so especially if you knew that your APOE system was less optimal than average. Indeed, results from the recent REVEAL study suggest that folks who are in their 50’s are not unduly distressed to make this genetic inquiry and find out their genotypic status at this APOE polymorphism – even though those who discovered that they were epsion-4 carriers reported more negative feelings, understandably. Still, with a number of education and intervention strategies available, an optimistic outlook can prevail. Furthermore, there are ever newer diagnostic strategies that can improve the rather weak predictive power of the genetic test. For example, cognitive assessments that measure hippocampal-dependent aspects of memory or visual orienting have been shown to be valid predictors of subsequent dementia – even moreso in populations that carry the APOE epsilon-4 allele. Other forms of neuroimaging that directly measure the structure and function of the hippocampus also have tremendous sensitivity (here for a broad review of imaging-genetics of AD) and can, in principle, provide a more predictive view into one’s distant future. On the very cutting edge of this imaging-genetic crystal ball technology, lies a recent paper entitled, “Distinct patterns of brain activity in young carriers of the APOE-e4 allele” by Fillippini and colleagues [doi: 10.1073/pnas.0811879106]. Here, the research team asks whether individuals in their late 20’s show structural/functional brain differences that are related to APOE genotype. They employ various forms of imaging analysis such as a comparison of brain activity when subjects were performing a novel vs. familiar memory task and also an analysis of so-called resting state networks – which reflect a form of temporal coherence (brain areas that oscillate in-sync with each other when subjects are lying still and doing nothing in the scanner). For the analysis of the memory task, the team found that APOEe4 carriers showed more activation in the hippocampus as well as other brain regions like the anterior midbrain and cerebellum. When the team analysed a particular resting state network – the default mode network – they found differences in the medial temporal lobe (containing head of the hippocampus and amygdala) as well as the medial prefronal cortex. According to the paper, none of these differences could be explained by differences in the structure or resting perfusion of the young-adult brains in the study. Wow, these results seem to suggest that decades before any mild cognitive impairments are observable, there are already subtle differences in the physiology of the APOEe4 brain – all of which could be detected using the data obtained in 6 minutes of rest. 6 minutes of rest and spit in a cup – what does the future hold?